Unfortunately, responses like the above are the typical reaction I get when I tell people that I “race go-karts”. For whatever reason, the general perception of a go-kart is far, far from the reality of it. The reality of karting is that it’s the purest form of racing. These are purebred racing machines capable of speeds of over 100mph and 3g of lateral cornering force. Tuned for speed and nothing else, karts are the breeding ground for the future stars of NASCAR, Indy Car, Formula 1, Sports Cars, and beyond. Sticky, grippy racing slicks, bespoke racing engines, chromoly Italian-made chassis, four-wheel ceramic disc brakes, and advanced computerized data acquisition systems are some of the commonalities of the modern racing kart. This is not your average putt-putt (concession) kart. More on the history of karting here. Karting is, without a doubt, the breeding ground for future stars in all walks of racing. Ayrton Senna, Michael Schumacher, Jeff Gordon, Helio Castroneves, Sebastien Vettel, Tony Stewart, Jamie McMurray, Dan Wheldon, Danica Patrick, Dario Franchitti, Michael Andretti, Scott Speed, (the list goes on…) all came out of karting. It’s such a great family sport, too. I tell people that it’s for “ages 5-95” – you can start your driving career at just 5 years old, and i’ll often see 3 generations of family at the track. 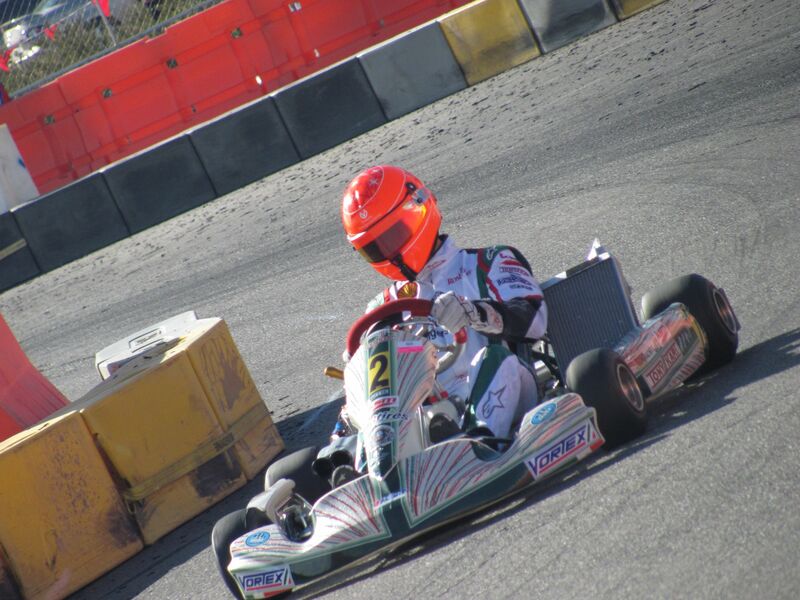 Michael Schumacher, F1 legend, regularly gets behind the wheel of a kart to stay sharp and have fun! Part of the vast appeal of karting is its simplicity. Since day 1 in Pasadena, a kart has been nothing but a simple steel frame, small (typically a single cylinder) engine, four wheels, and a driver. True racing karts have no suspension, no differential, and rely on pure physics (the chassis metal flex characteristics and geometry) to help it achieve the fantastic speeds they’re capable of. Karts are the ultimate power-to-weight machines (similar to an Indy Car) thanks to their low weight (often under 400lbs with driver), and can literally drive circles around even the most extreme street cars on pure grip thanks to their low center of gravity. Seriously, a $3000 go kart can outrun a $250,000 Ferrari at the race track. For the same reasons, Karting is arguably the best bang-for-your-buck in wheel-to-wheel racing out there. Also, unlike virtually any other racing machine, it can be taken to the track in the back of a pickup truck with minimal equipment, and yet the guy who shows up in the back of his F150 can run with the guys who showed up in the semi trailer. The driver is the great equalizer. Ayrton Senna famously called karting “the purest form of motorsport” for good reason; the driver’s skill is still perhaps 80% of the equation. Regardless of the size of your trailer, your budget, or your team…it’s still all about the driver (well, and some tuning, too). But enough reading, what can these things really do? Here’s a short video of what karting is all about. So read on, pick up yourself a kart (it doesn’t matter if it’s old, new, fast, slow, red, green, blue, Shifter or TaG) and head out to your local track. You’ll be hooked. I know I was!